Prime Minister Sheikh Hasina on Monday asked her Canadian counterpart to return Bangabandhu’s killer Noor Chowdhury to Bangladesh. The premier made this call during a telephonic conversation with Canadian Prime Minister Justin Trudeau today. Noor Chowdhury, a death row convict, for assassinating the Father of The Nation Bangabandhu Sheikh Mujibur Rahman, is residing in Canada. Assistand press secretary to Prime Minister Imrul Kayes Rana ensured about the phone conversation. Justin Trudeau assured sheikh Hasina to take initiatives for sending of the self-confessed killer Noor Chowdhury. 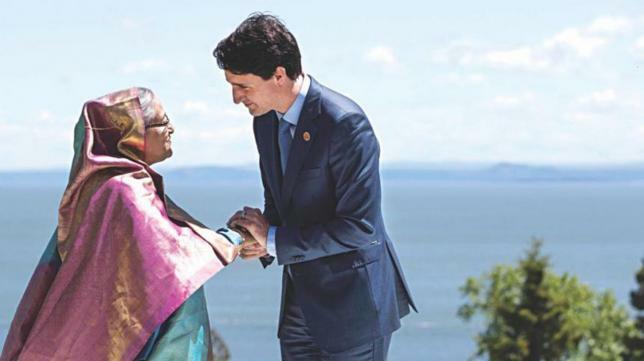 Earlier, Prime Minister Sheikh Hasina and her Canadian counterpart Justin Trudeau called upon the global community to act together to stamp out terrorism during the nearly 20-minute conversation. Meanwhile, Canadian prime minister expressed relief that members of Bangladesh cricket team remained safe in the New Zealand twin mosques attack.